Extreme Care Appliance Service understands how important it is to have your appliances serviced correctly and in a professional manner. You can be rest assured that your dishwasher, refrigerator, range, washer, dryer, garbage disposal, etc. will be properly serviced and tested by our experienced, insured employees. 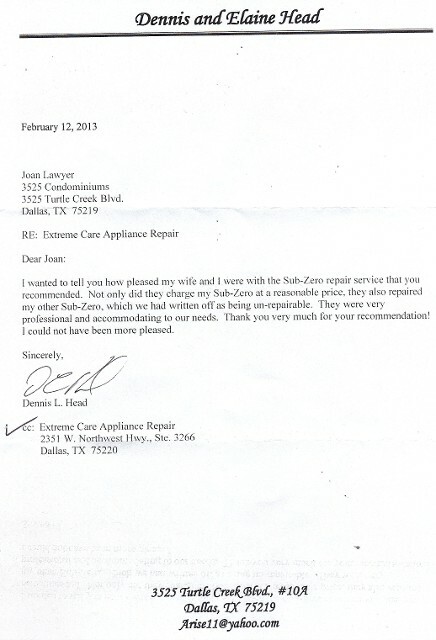 Extreme Care Appliance Service can repair most brand of appliance for your home or business. Call us today at (972) 505-3390 for same-day Appliance Service, maintenance & repair services. Extreme Care Appliance Service can repair almost all appliance, including gas and electric ovens and dryers. Our technician is a sealed-system refrigeration specialist that has all common parts on hand to make repairs. If we don't have the parts we can order them and then set up a date for the service call.